Just the other day I saw Benjamin Percy and Szymon Kudranski waiting in line to see some movie about a 'Justified Dawn' or some such nonsense. I think it was March, 2016, and had something to do with DC Comics, but I could be mistaken. I think it was a boxing movie, because everyone else was arguing over who would beat who and the two of them were just standing there muttering about some guy named Oliver. Does Oliver Stone have a new boxing movie out? Yeah, that's right. I'm quoting that guy who's totally not Hal Jordan, Nick Walker, or Wade Wilson. So let's not get distracted by one guy being four different comic book characters from three different source companies. Let's focus on this issue of Green Arrow instead, where we get VAMPIRES VERSUS WEREWOLVES. Sort of. Not really. 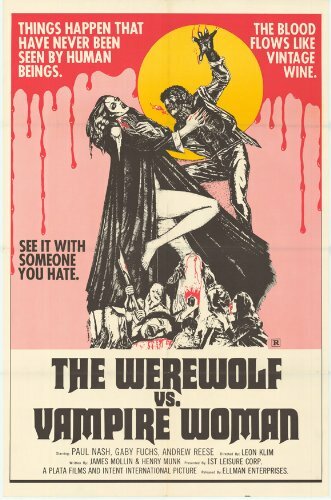 Basically they're scientifically-explained variants based upon this theme, which is kind of awesome in its own right, and we all really should have seen the creepy old antediluvian style vampire coming. In a world where we've got literal vampires running around for centuries, we've also got this Norse-legend-influenced disease that approximates the werewolf legend with a bit of comic book science. And then we circle around back and get a 'comic book science built maybe-vampire type guy' who's lived long past his time, but has yet to be revealed to literally grow fangs and bite folks like our good friend Lord Andrew Bennett does. How does he do it? Volume! Volume! (Turn up the volume! Now you've heard it advertised; don't hesitate!) That's right. “U GIVE BLO0D, WE G1VE $.” It's been a while since a sign in the background (okay, mid-to-foreground) gave me such a good giggle. Well played, gentlemen. I know exactly what sort of neighborhood Pennytown is now. And then the totally-not-really-werewolves get themselves mixed up in the totally-not-a-vampire's dastardly plan. This sure as hell ain't going to end well, especially when you throw the suburban hate gang in to the mix. Oh, and of course, our aforementioned totally-not-a-vampire is going to hire that guy on the cover of the book for a nefarious plan that might just be Oliver's solution to this little Lukos infection. Good thing the Lukos is growing out some massive facial hair in preparation for his Rebirth Van Dyking, though, eh? Amazing art continues to be amazing. I'm not sure what more I can say about Kudranski's work and how well it fits the Warg story arc, but I'm sure as hell going to miss it after Rebirth. He continues to deliver magnificent renditions of Ollie and the Wargs, and has added an extra level of creepiness with Paragon and his ram's head décor four poster. As with Emiko last month, the prostitute in this issue felt a little bit like a porcelain doll, but I'm beginning to wonder if that's more Eltaeb's colors than Kudranski's art. Without publicly released copies of every phase of the art process, it's kind of hard to determine where the fault lies when something just doesn't quite look right on the page. Nonetheless, the story kept rolling. While there's a fair amount of action in this issue, and quite a bit of big story moments, the heart and soul of it was all about Oliver's confessions to Emiko about how he sees himself in the hero community. Percy has finally done what no other Green Arrow writer has done in the post-Flashpoint continuity and had Oliver finally confront his shortcomings in comparison to all the superpowered heroes -- the Justice League that snubbed him, the Justice League of America that briefly provided a paycheck but saw him only as a tool to a specific end, and the Justice League United that he walked away from to focus on the community level efforts he could wrap his head around. Even though it was triggered by the current Lukos infection and how it has “oatmealed” his brain to the point of making dumb decisions in the field that even the CW version of Oliver Queen would find short-sighted, the confrontation of his own doubts and acknowledgement that he became a hero as a means to compensate for his earlier selfishness is a character development that's been a long time coming. It was very well executed and very much appreciated by fans. Maybe not as much as the beard, but, well, fans can be weird. We've got all manner of good stuff in this issue to surround Ollie's little self-discovery moment. As always, there's Fyff, who not only gives us some numbers on estimating the Warg population in Seattle, but unveils a morally dubious little science project some might have expected earlier, some amusing trash talking with Ollie, and some completely gratuitous gut exposure. Thanks, Szymon. And then there's Emiko, very concerned for her half brother in one scene, and utterly disappointed in him in another. While I was initially bummed about Emi's personality change between Lemire and Percy's characterizations, I've come to really appreciate what Percy has added, giving Emiko some depth and really defining some shape to her evolving relationship with Ollie. It has helped to differentiate her as more than a female archer version of Damian Wayne, not just in mentor relationship but in emotional maturity and how they adapt to their new environments. If you've already read the solicits for the last two issues of Green Arrow prior to Rebirth, you know we've got some globe-trotting ahead of us. That quest sets out in this issue… and introduces what may be some very awesome references to characters we haven't seen in a while. On top of that, we also get a link I wouldn't have expected. Or perhaps it just has a number of coincidences that get me speculating. We'll just ignore that whole “He's probably cries himself to sleep clutching a teddy bear" nonsense. This issue really turned the corner in the Lukos arc from feeling like an ongoing comic to one that's really heading to an endgame. 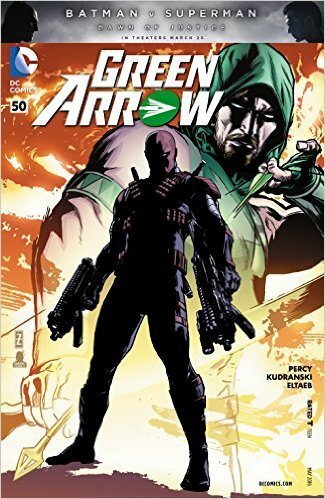 In this case, we know that we're building up to Rebirth, and most likely will see both the Berserkers v Patriots war come to a head over these last two issues, but if you've read the solicit for Green Arrow 52, it looks like one hell of an escalation is coming in the showdown between Ollie and Slade (Though, by the time this is published, said escalation will likely already be out) [Editors Note: Correct, mountain-boy]. Either way, I'm kicking off the countdown and setting this issue to Shel Silverstein's 25 Minutes to Go, care of Johnny Cash. “What kind of navigation officer can't tell left from right? !” -- Okay, so maybe this doesn't really work as a comparison to the issue itself. 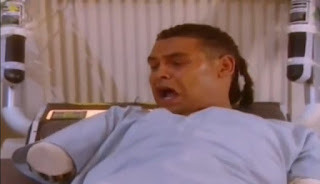 But you know you couldn't NOT picture that scene from the Epideme episode of Red Dwarf when Andrew realized he was infected by the Wargs (Thus Andrew is to Dave Lister as Jimmy is to Kristine Kochanski?). Lukos is to werewolves as Epideme is to zombies. Right? I'm not the only one…? Nanobots, people, nanobots! Our friendly neighborhood thus-far-nameless Police Chief is back! You know that makes me happy. But he's trying to tell people that the Wargs of Seattle will be treated "with care" at “guarded isolation camps” . . . that doesn't sound like anything that's going to end well. Oliver's gentleman philosopher monologue (which has been very gracefully dulling as his brain oatmeals) manages to put forth the observation that “there are only two hundred days in recorded human history when we haven't been at war,” something I really wanted to validate, but the closest I could come up with is the validation that the most recent time without a record of war was in 597, which was more of a temporary cease fire, which makes the claim seem not too unrealistic. But right now, I've got three questions about this issue. First and foremost, did Percy just pull a character from the otherwise very intentionally lost to the sands of time Superboy and the Ravers from the late 90s in to current continuity? 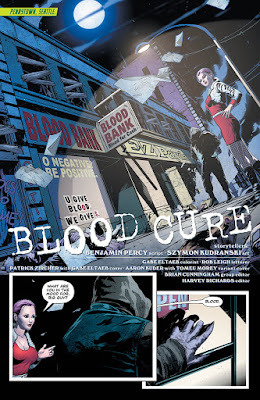 Is this Doctor Miracle guy (presumably the same “miracle worker” that Paragon is seeking) who appears to heal any injury or disease by injecting them with his own blood really Hero Cruz? That aircraft that Deathstroke is flying looks an awful lot like the one Agents 1 and 37 are flying around the world with in Grayson. Does Deathstroke work for Spyral now? Or did he just steal the hoverjet? Remarkable coincidence? His little critique of Paragon's intentions seemed a bit more... moral than his typical post-Flashpoint attitude. Plus, "his name has 'stroke' in it. That sounds like a nice thing." Those guerrillas that Emiko and Oliver run in to look like their upper face and scalps are pale compared to their natural skin tone. Almost as if they were marking themselves to resemble the mask that Massacre wore (in Batwing). Did the Queen Industries Not-So-Stealth-Jet actually make it to Nigeria before crashing, or did the Queen kids just find themselves in the Democratic Republic of Congo? Anyway, yeah, chainsaws, man. Sounds like a bad plan.